Manufactured in Etats-Unis from 1910 until 1912. 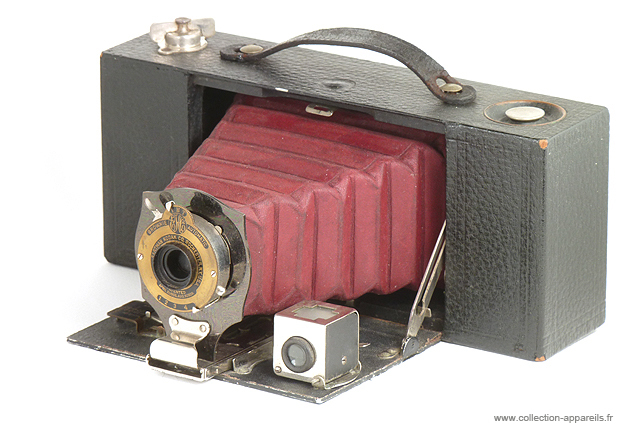 This is a red bellows version of the Kodak No. 2A Folding Pocket Brownie, manufactured from 1910 to November 1912. We can ask questions about the size of 'pockets' that could receive it (21 cm wide!). This device is a real theater with its wide size, its bed as a scene, the red bellows in the background, the delicate hidden controls of the front and back.